Details: 22lbs. !! 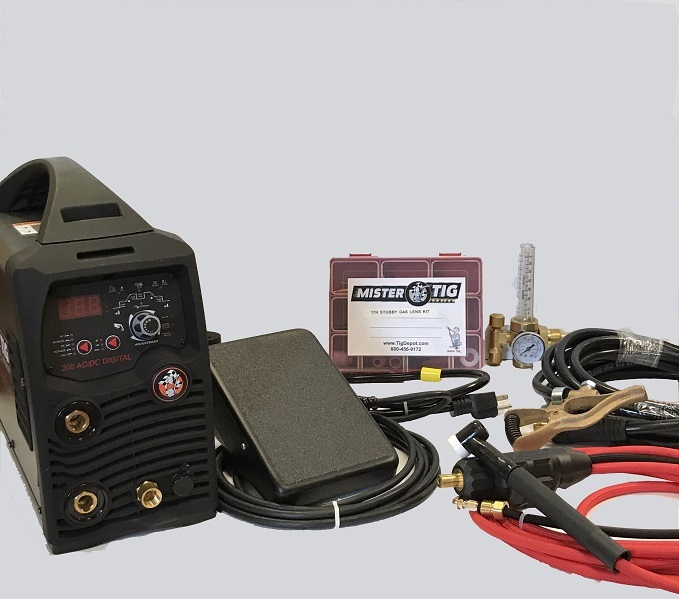 !MISTER TIG/ARC 200 Amp AC/DC Inverter Welder Digital Control - 115/230V Features : MISTER TIG 200 AC/DC DIGITAL: SPECIFICATIONS Input power : AC 230V AC115V Plus/Minus 15% Input freq (htz) 50/60 HTZ Max input current : 34A 21A Input Power Capacity: 7.4KVA 2.2KVA Rated output current: 160A (ARC) 60A (ARC) 200A (TIG) 95A (TIG) Output current Range: 10-160A (ARC) 10-60A (ARC) 5-95A (TIG) No Load Voltage: 58V Rated working Voltage: 22.4 (ARC) 5-200A (TIG) 58v 26.4 (ARC) 18.0 (TIG) 13.3 (TIG) Efficiency : 84% Duty Cycle: 160A (ARC) 30% 110A (ARC) 25% 200A (TIG) 25% 140A(TIG) 40% Power Factor: 0.68 0.76 weight (Machine) 22 Pounds *ARC SET OPTIONAL - Latest Inverter Technology - AC/DC HF TIG/ARC Function - Arc Ignition HF Oscillation - AC Square Wave 20 - 250Hz - AC Balance Control Adjustable - Pulse Frequency 1 - 200Hz - Pulse Width - Base Current 5 - 200A - Up Slope 0 -10 sec - Down Slope 0 -15 sec - Pre Gas 0 - 5 sec - Spot Function - Post Gas 0.5 -20 sec - Trigger Function 2/4T-Spot - Arc Ignition Current user selectable - Arc Ignition Time Automatic - Professional SSC Foot control as standardThe MISTER TIG digital 200ACDC is a Digital Controlled Square Wave AC/DC TIG inverter welder. Intelligent digital control of the main functions are realized by intuitive software providing ease of operation and high accuracy. Full TIG functionality, offers simple step by step digital control of functions and parameters providing complete professional control. HF arc ignition provides Pre Gas with instant arc ignition leaving no tungsten inclusion or contamination of the tungsten electrode. Digital set of Pre Gas Time, Start Current, Up Slope and Down Slope Time, Finish Current Level and Post Gas Time with the choice of 2T or 4T trigger function allows control of the welding process at a professional level from start to finish. Digital Pulse Control gives full parameter setting of Peak & Base Current, Pulse Frequency & Pulse Width providing control of heat input, penetration & distortion. AC Square Wave Balance gives control of the electron flow at the tungsten, the AC TIG arc can be adjusted from maximum oxide-layer cleaning on aluminum through to a deeper penetrating weld. Remote Control Interface provides remote amperage control at the foot-pedal control. The Selectable Tungsten feature allows the user to initiate softer arc starts when using small tungsten with thin metals avoiding burn through on their work. When using a larger tungsten it requires a larger initial current and by selecting a larger tungsten size it avoids arc stutter or lack of arc initiation. DC ARC welding delivers a smooth and stable arc for easy welding of electrodes producing high quality welds including cast Iron, stainless and low hydrogen. Arc Ignition and Arc Force control allows you to set the ideal arc condition no matter what electrode you choose. Optimized auto protection of the power input provides auto shut down of the machine when large scale fluctuations occur. Unique air channel design increases the heat dissipation of the power device, control circuits, minimizes dust absorption, thereby greatly improving longevity and reliability.MISTERTIG 200ACDC is the new standard for Dual voltage welders making it the ideal choice for both the experienced professional welder and the weekend Warrior alike. 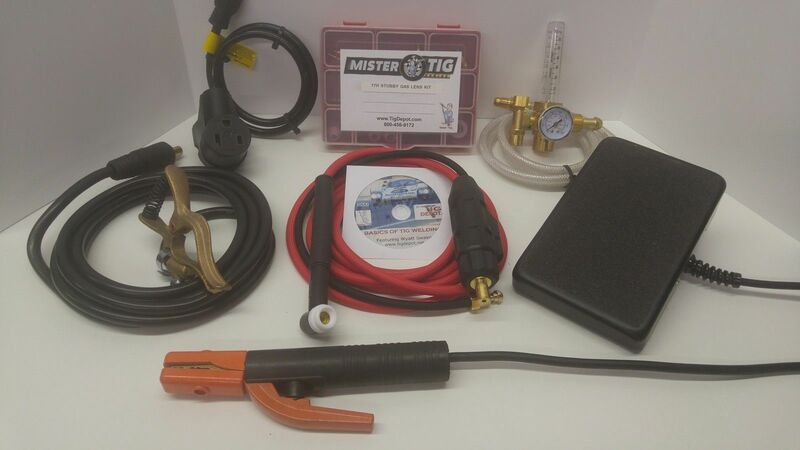 Built to our specifications and manufactured in compliance to CAN/CSA 60974.1 MISTER TIG MACHINE PACKAGE: Standard option includes:MISTERTIG 200 digitalAC/DC Machine, CK17 flexhead torch with a 121/2 superflex cable, 13ft, Earth Lead , Argon MISTER TIG 60 REGULATOR/ FLOWMETER, 6ft Gas Hose with fittings, Power Adapter, MISTER TIG 17H STUBBY GAS LENS KIT, STICK ELECTRODE HOLDER/CABLE AND PROFEESSIONAL FOOT CONTROL.. FREE SHIPPING LOWER 48 STATES. CART NOT INCLUDED!! ALL PARTS AND WARRANTIES GUARANTEED BY MISTER TIG IN THE U.S.